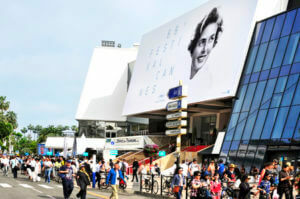 Cannes Film Festival is held in Cannes, on the French Riviera, which previews new films of all genres, including documentaries, from all around the world. This is the largest and most prestigious of all film festivals, and is the festival that awards the coveted Palme d’Or (Golden Palm) Award for the best film. In 2017 the Spanish film director and screenwriter Pedro Almodóvar has been selected as the President of the Jury for the festival. 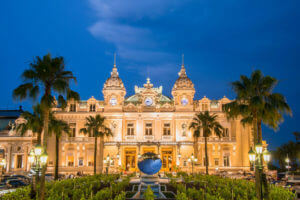 Come to French Riviera to see the movies of Cannes Film Festival and stay at Villa Anabel for an unforgettable week! During festival days you can spend great time in our luxurious villa with full privacy. Villa Anabel is a harmonious blend of glamour, tranquility and seclusion and is located only a few minutes helicopter trip or an hour drive from Cannes Palais des Festivals. 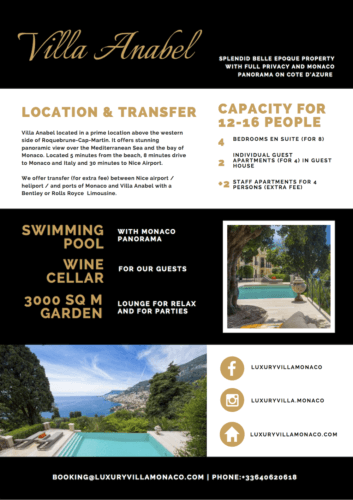 If you want to participate in the pulse of Cannes or Monaco after that relax in a private hotel, Villa Anabel is the perfect choise . Our wine cellar and swimming pool with Monaco panorama in addition to exceptional outdoor areas are ideal for intimate lounging. You can keep your privacy, rent the villa with or without in-house staff. We offer you bespoke services too: eg. party organising, breakfast, catering, concierge services, limousine, yacht or helicopter transfer. Enjoy the tranquility, luxury and services offered by Villa Anabel and our in-house staff! Book your stay in a private villa with 6* services for your family, friends or your business partners!